Wisconsin UPS drivers demand a good contract | Fight Back! 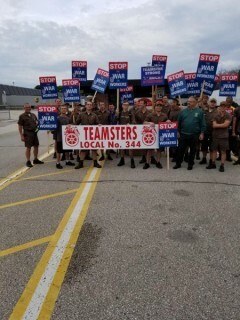 Milwaukee, WI - On the overcast morning of June 22, over 50 package car drivers and part-time workers at the Elm Grove hub came to work early for a parking lot rally led by Teamsters Local 344. The mood of the rally was set by news the night before that a ‘handshake deal’ had been reached between the national UPS and Teamster negotiating committees that included lower-than-expected wages for part-time workers and a second tier driver classification that would work weekends. The workers present were not sold that this was the best contract their negotiators could get. Many brought up the fact that UPS is one of the most profitable companies in the country, yet they refuse to pay part-time workers a living wage or pay all drivers at the same wage rate. Fired up, the workers rallied with their Local leadership, all in agreement that the only way they can get a contract they deserve is if they stand united. Local 344 has never flinched from stating that their part-time members deserve a living wage, that drivers deserve more time with their families and that their contract needs to have the strongest anti-harassment language possible to protect workers from zealous supervisors. The rally ended with the workers chanting, "Who are we? Teamsters!" and "Worker power!" It was clear to all present that Wisconsin's Teamsters will not accept a concessionary contract, and are willing to fight for better.